n the tango milieu the expression River Plate tango, is commonly used with the object of assigning to it, with imprecise origin, a common validity on both banks of the River Plate. In fact, such a posture is exclusive of these lands because at international level, from the beginning of the twentieth century, there were no doubts in this respect, being the genre named since then as «Argentine tango». Even, because of its popularity abroad in the last decades, it is labeled this way, without so at least be guessed an Uruguayan participation in its genesis or its repertoire. An antecedent that happened regarding the theatrical activity can be tracked down to connect it with events of the River Plate area. It is the case of Vicente Rossi in his book Teatro nacional rioplatense, published in 1910 that originated Mariano Bosch's answer in his work Historia de los orígenes del Teatro Nacional Argentino of 1929. In it, this author demonstrates how inappropriate is the Uruguayan intent of attributing themselves a leadership either in authors, milieu or artists. Another similar intention is sought regarding tango during the first two decades of the twentieth century, although such a posture is not reflected when we track down the Uruguayan presence in publication of written music or records. And neither it is overwhelming in the 20s. Nevertheless, to clear suspicions of partiality we will appeal to the testimony of an outstanding witness: the Uruguayan pianist Alberto Alonso and his essay entitled La cumparsita - Historia del famoso tango y de su autor, published by Mosca Hnos. S.A. de Montevideo, in 1966. 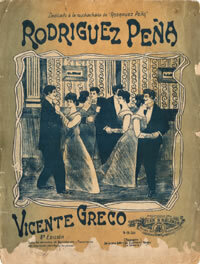 But before approaching it and from the chronological point of view, we have to take into account that in Argentina tango with a local flavor —since 1900, «tango criollo» in many sheetmusic copies— was already in vogue at least since 1890. This happened either on the theater stages, dancehalls of all types and in all social classes, with hundred of composers, interpreters and massive public. Especially at the turn of the century with the works of Ángel Villoldo, Manuel Campoamor, Enrique Saborido, Alfredo Bevilacqua and so many others. We shall see that by that time the Uruguayan tango movement did not have any relationship with the one developed then in Argentina. And I mention the country, because although it took place mainly in Buenos Aires, the diffusion of tango cannot be ignored in cities of the interior, such as Rosario or Córdoba. A first clue is given by Eduardo Colinet in his foreword to Alonso's work. He regards the latter as «one of the pioneers of tango among us». Considering that as the author himself indicates, he put together his first orchestra in the autumn of 1916, let us compare this information with what was already carried out by then in our country, existing compositions of the level of “Alma de bohemio”, “El entrerriano”, “Rodríguez Peña”, “El amanecer”, “Sans souci.” And by that year “Re fa si”, “La guitarrita”, “Comme il faut”, “Ojos negros”, “Mi noche triste (Lita)” were about to be launched. As for the orchestras, the ones led by Roberto Firpo, Eduardo Arolas, Juan Maglio (Pacho), Vicente Greco, Francisco Canaro and so many other directors were firmly established. That forces us to oppose pioneering or Uruguayan beginnings to the full aesthetic and stylistic maturity of Argentine tango. But let us go to Alonso's testimony who entitles his first chapter La avanzada del tango: «Montevideo was lagging behind in the tango race that had favorably started in the neighboring riverbank and was developing with very defined features. And although from the beginning of the century some milonga guitarists were already playing, there were not strictly tango musicians here.» (page 13). Such an absence is conclusive. It appears that Montevideo was really lagging behind as Alonso says. And no less than about 25 years. He also comments: «a pianist named Carlos Nieto stood out but he didn't have too much musical instruction", he was specialized in "milongones". But he developed his art "without adapting his playing to what was used in Buenos Aires as regards tango"» (page 13). Alonso himself emphasizes this state of things, because when mentioning a Nieto's number entitled “La galarza” he tells us that it only had «something of tango». Facing this panorama, the young Alonso devoted himself to Villoldo's tangos because he understood «the teachings contained in the maestro's works», from which he extracted «all the sap that ought to guide my craft as tango musician» (page 13). Then, by transitive logical relationship, the genuine precursor would have been Ángel Villoldo and not an original inhabitant of that oriental land. Furthermore, according to the author toward 1907 the pianist Prudencio Aragón, also an Argentine, arrived. The latter can be regarded as «the one who started the authentic tango era among us». (page 13). As the judicial saying goes, when one of the parties confesses there is no need of evidence. If an Uruguayan witness of the period affirms that only toward 1907 the tango era began, taking into account the age of the Argentine tango, a supposed existence on both banks of the River Plate is dubious because it would imply to have had parallel developments. But that such a concept can be applied specifically since the mid- 30s, it is quite a different thing. And therefore the chronological scope of the denominations should be stated. Later he continues narrating about the arrival of other Argentine musicians. Due to the inaccurate reference we may guess we are already in the 10s. Their arrival, he affirms, contributed with «the tango cause in our milieu» (page 14). 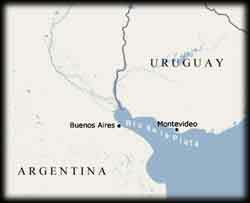 With that the supposed River Plate tango continues being nurtured, mainly, by Argentine elements. As a consequence of these influences and presence, «this way the first stable groups were forming», which counted «with the collaboration of the Uruguayans» (page 15), that is to say that in the mid- 10s the orchestras were put together mainly with Argentine musicians and some Uruguayans. Among the new local players, the author mentions the bandoneonist Minotto Di Cicco who in 1914 devoted himself to the bandoneon, because until then he had played the half-tone accordion. 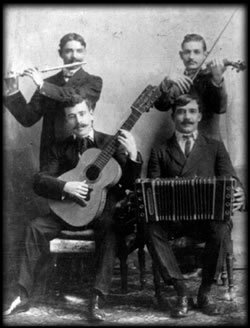 In sum, the pioneer of the Uruguayan bandoneonists began to work with that instrument only that year, when in Buenos Aires Maglio, Arolas, Greco, Augusto Berto, Genaro Espósito, Arturo Bernstein, Loduca had been standing out for a long time. An eloquent difference in time and quantity. By virtue of these contributions, «tango advanced in our city with more defined features» (page 16), because of that the premiere of the «famous Argentine orchestra led by Juan Maglio» caused a great commotion, this event happened around 1914 or 15. When he returned to Buenos Aires, «Montevideo was left with its limited number of tango musicians» (page 16). Compare this information with the numerous musicians and tango orchestras that by then and since several years before we have had in our country, recording profusely and appearing everywhere in cafés and dancehalls, even in the interior. As part of «that outpost of tango» in Uruguay, Alonso mentions Carlos Trapani who, «in his musical publishing house, encouraged the local tango output» (page 16). Again, let us compare this novelty with the great number of Argentine publishers devoted to all kinds of music including, of course, tango, existing at least after the turn of the century. Another event was the arrival in Montevideo of a quartet led by Roberto Firpo, which debuted in the tearoom La Giralda in the early 1916. On this occasion he arranged and premiered “La cumparsita”. This hit convinced the young Alonso of forming an orchestra modeled after the famous quartet that would be a innovation since «... until then, all the tango groups were trios» (page 20). Another major difference, because in 1916, the Argentine orchestras in general had a piano, a bandoneon, two strings and a flute. The author tells us that he made his decision, because he was «convinced that he had some local capable players» for such an undertaking. This statement, bears the recognition of an opposed reality. That is to say, he was aware of the difficulty of getting musicians for that purpose. In 1916 when Arolas's “Anatomía” and “Rawson”, Bardi's “Independent Club”, and Greco's “Racing Club” were premiered in Buenos Aires, to name only some that later became classics, nothing important happened in Uruguay. Accordingly, that year what would be the first orchestra, according to Alberto Alonso, or rather, a quartet similar to the one Firpo presented was just being formed. When we knew that quintets in Argentina were already common. But also after Alonso tenaciously managed to put together his orchestra, the latter quickly became outdated. Indeed, in the early 1917 the Argentine tango outfits became rich. 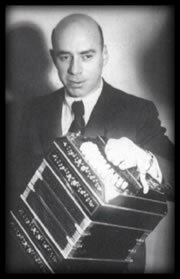 For recordings Arolas added a violoncello and Fresedo teamed up his bandoneon to Vicente Loduca's, among other examples. Continuing with comparisons, let us remember the astonishment of the Montevidean public when on the celebration of the Independence Day the Uruguayan Anthem was played at the venue. Well, «nobody could imagine that a tango quartet was able to play it» (page 21). In Argentina, at least since 1913, tango groups displaced salon orchestras and/or bands on recordings to commit to disc all kinds of popular and patriotic music. 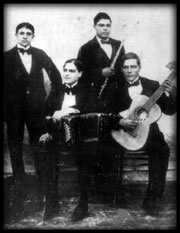 For instance, during 1913/14, there were three recordings of the Marcha de San Lorenzo by the tango orchestras led by Pacho, Toyito and Biggeri, respectively, on Columbia, Favorite and Arena Records. Then, that some tango orchestra had played our anthem would have been something almost obvious. Argentine obviousness, Uruguayan astonishment. Finally, and leaving aside Alonso's book, let us observe the then Uruguayan discography. 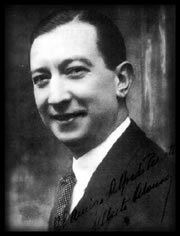 Three orchestras only recorded between 1917 and 1929: Alonso-Minotto (1917), Minotto (1922) and Donato-Zerrillo (1929), the latter nearly 20 years after the Orquesta Típica Criolla Greco (1910). Three orchestras in twelve years show an eloquent difference regarding the number of Argentine ones that succeeded in recording in such a period, as well as the immense repertoire recorded by them. And it's worthwhile to highlight as for records sales that the Uruguayan and the Argentine markets were in fact just one, but nurtured almost exclusively by Argentine artists. The above data and testimonies force us to refer with more precision to the concept of «River Plate tango», beyond the affection that we feel for our Uruguayan brothers and sisters, the admiration toward their interpreters or the desire of making their contributions ours.